Road Trail Run: Reebok Floatride Run Fast Multi Tester Review: FAST, Very Light and Friendly! Reebok Floatride Run Fast Multi Tester Review: FAST, Very Light and Friendly! Reebok hasn't been a brand one would associate with running shoes in recent years. That hasn't always been the case. Until 2017 their focus seemed to be more on cross-fit and obstacle racing. In the 1980's this wasn't the case as Reebok athletes such as marathon great Steve Jones (still affiliated with Reebok) set a world record in Chicago while Sydney Maree set the world on fire in the 1500 and 5000 in the same period. Although Adidas-Salomon acquired Reebok over 10 years ago, it was only in 2017 that Reebok started to show some signs of the trickle down technologies that Adidas used to gain inroads into the running market in recent years such as TPU midsoles and knit uppers. 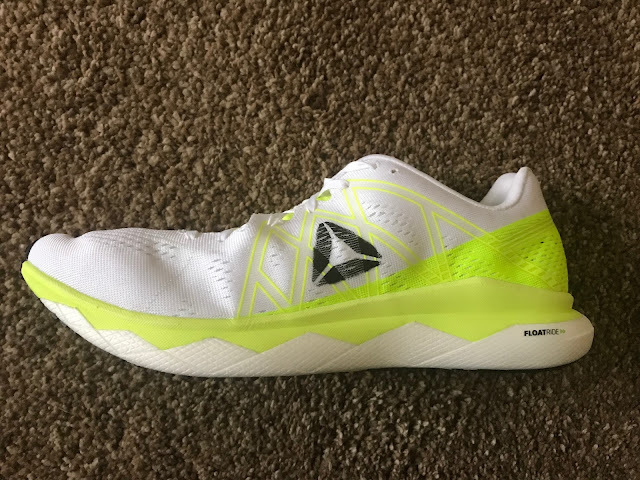 In early 2017, Reebok gave us a taste of things to come when they released the Reebok Harmony Road, sporting their first foray into a TPU-based midsole, KooshRide (which seems to behave similarly to Adidas's Boost foam). 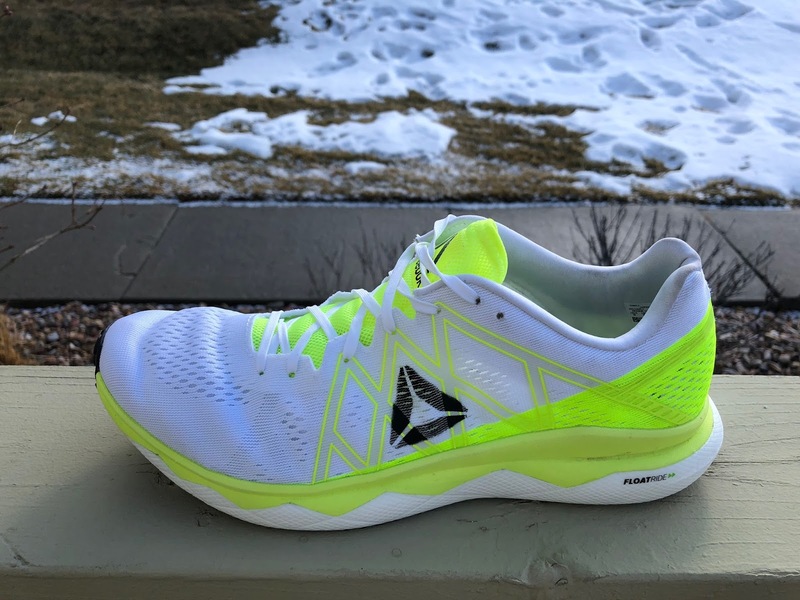 Subsequently, Reebok released the first shoe in its Floatride range, the Floatride Run (RTR review), featuring a knit upper on a new dual density midsole platform combining super light and responsive PEBA with EVA, hoping to turn heads in both the running and athleisure markets. In July Reebok will be releasing the second shoe in the Floatride line, the Floatride Run Fast. The Fast is already proving itself at the front of the pack as 4th place 2018 Boston finisher Tyler Pennel wore them, while Nicole DiMercurio 6th, wore a version of the 3 oz.Pro (RTR review) to great success. The Run Fast, like the earlier Floatride Run, also pays homage to Reebok's long run heritage (over 100 years) and to the original 1984 Sydney Maree Trainer. 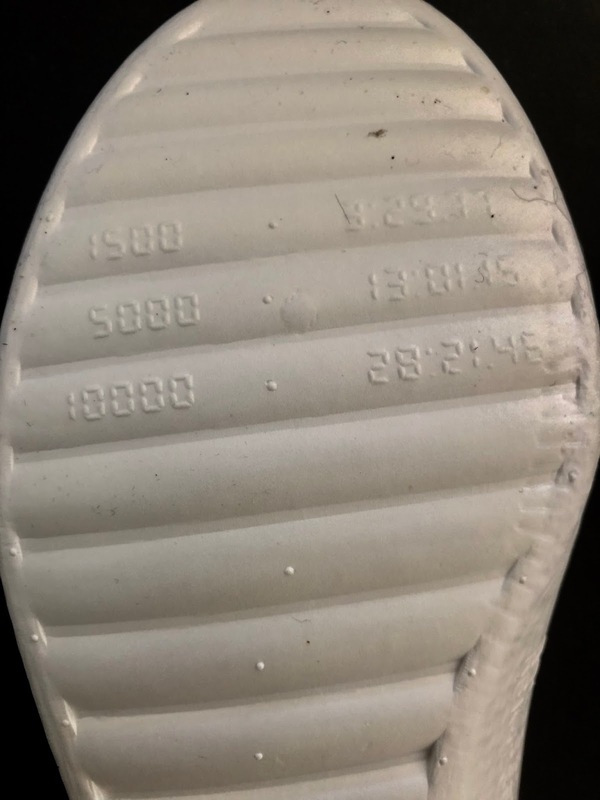 You can see that they have once again printed Maree’s personal bests on the underside of the insole of this shoe. If the Run was designed with comfort in mind, the Run Fast has taken matters a step farther by giving the shoe extra gears and dropping the the weight significantly well into race flat territory while retaining a cushioned and highly responsive ride. Stack Height: 25.5mm heel/17.5 mm forefoot, 8mm drop. A neutral shoe meant for uptempo runs, racing and long runs alike. 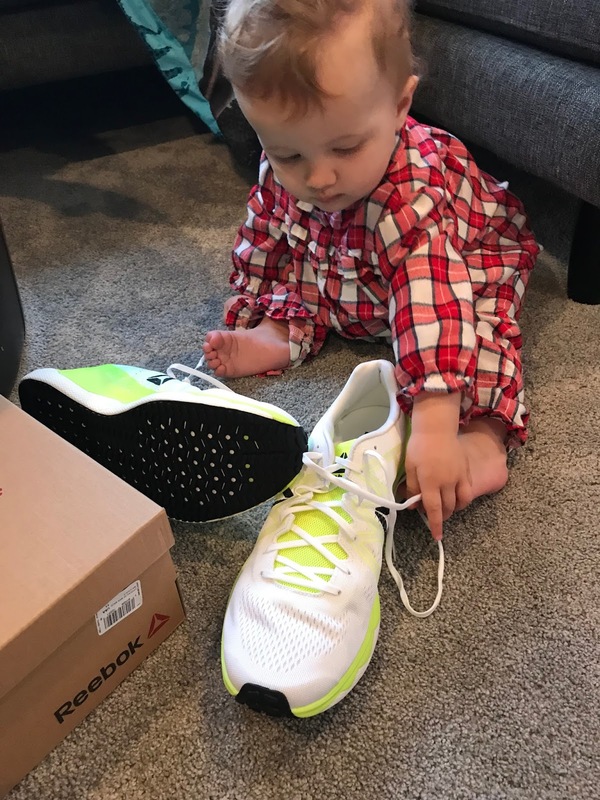 Derek: The Run Fast was one of my must-try shoes for 2018. Just based on the specs, and the midsole feel of the original Run, i knew anything similar with a conventional upper would be a huge hit. I like the simple elegant colors of the Run Fast. Anything with a white base is always going to look classy in my book. Initial step in feel was good. The upper was very comfortable and I was able to create a good wrap of the foot without having to do a whole lot with the lace tension. It fit true to size for me, with the right amount of volume in the heel and plenty of splay room in the toe box. Peter: I really wanted to like the Floatride Run, but the upper and the mid/outsole didn’t seem to work in sync. I didn’t like the cage and the ride was a bit ho-hum. I came to the Floatride Run Fast with lowered expectations--while still being hopeful. And my son thought so too!. It felt light and seemed like it might be a winner. Step in feel was terrific. Dave: I have had the Fast for almost 3 months now and have over 75 miles of workouts in on it and it hasn’t lost its touch from the maiden voyage run. Fit has molded to my foot like a true racer should and there have been no issues with blisters or banged up feet. The size 9 is spot on and is where I like it for a racer. If you like a little more room in a racer, you may want to go up a half size. The toebox is a bit pointy. Sam: My pair was a half size up from my normal size and was notably roomy for a half size up, the very light unstructured upper contributing to a very almost overly comfortable fit. Usually a half size up for me is fine with thicker socks but here it was at the limit. I was skeptical I would be able to effectively run in them but was surprised that while I would have been better off at true to size my foot was well held by the translucent overlays and heel counter. Derek: The upper uses a very thin inelastic engineered mesh. There are some almost translucent laminated lines across the mid-foot but none in the forefoot. The mesh itself is completely seamless which is great. There is no toe bumper up front but there is plenty of vertical height in the design so it’s not an issue at all. The heel uses a semi-rigid counter, which is comfortable and does not get in the way when you are running. The tongue is fairly thin, and is attached to the midfoot saddle on either side by a sheet of semi-elastic lycra about 1.5 inches wide. Overall, the upper is very light and breathable, and very comfortable. There isn’t a lot of structure in the upper, and I think that’s how things should be for a racing shoe anyway. I think many people will have no issues running sockless in this. Peter: I think the upper is terrific. It’s a nice light mesh. White looks nice but gets dirty fast. My only issue with the lovely, breathable, light yet supportive upper is that the tongue is a little hard to get in place. I find that it folds over itself, especially at the bottom of the lacing. If I’m not careful, the bottom of the tongue folds and I can see my sock through the top of the shoe. 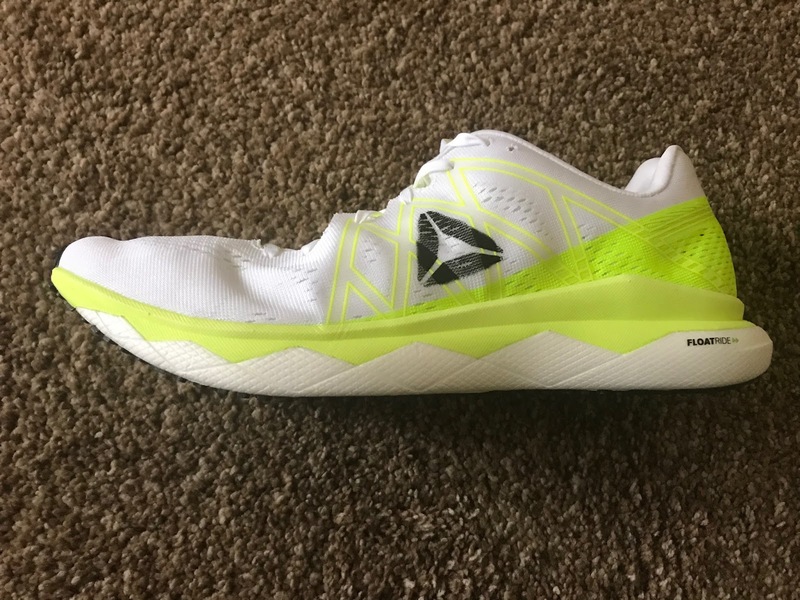 It would be nice if Reebok just affixed the tongue so that it wouldn’t fold or move. Dave: The upper has molded my foot, beautifully. However, because I have a narrow foot and have to crank down on the laces to get the fit I like, there is now some bunching at the end of the “throat” of the shoe. It is beginning to press down on the top of my foot, just before the toes. Otherwise, it’s a simple upper of engineered mesh that works well with your foot. The breathability is really solid. Sam: I agree with my fellow testers this is one beautifully fitting minimal upper which can be run barefoot by many. No race flat snug and cramped feel here. As noted, the tongue and front bunching could use some work but I was at a half size up which was in this shoe made them big for me. Derek: The midsole uses the same dual density Floatride tech that was seen in the Floatride Run. 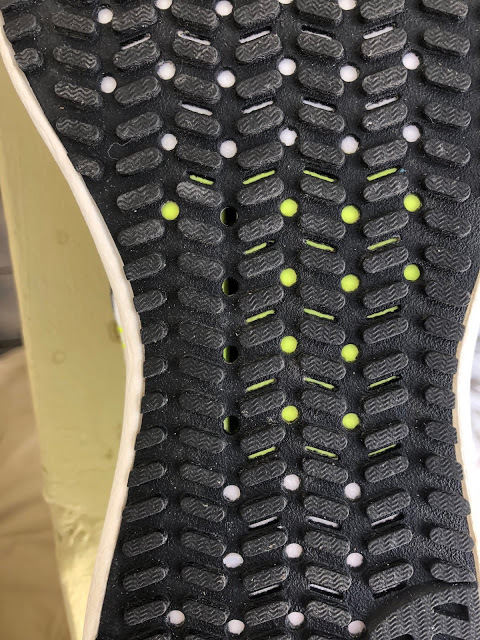 The white Float Foam, a TPE (Thermoplastic Elastomer) similar to what is used in the NIke VaporFly 4%, is very soft, while the lime EVA foam is much denser and firmer. 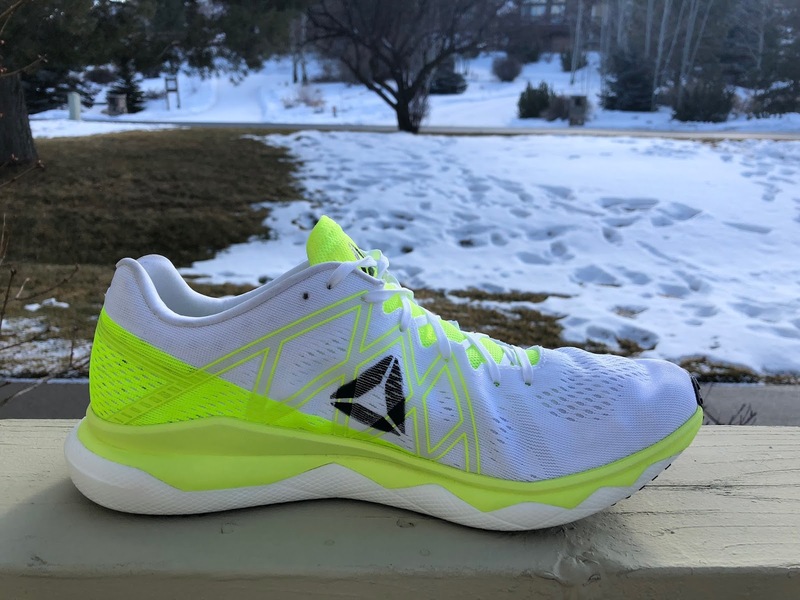 You will note that with the Fast, the saw-tooth configuration of the dual density lime EVA foam extends much farther back towards the heel than in the original Floatride Run. In the Fast, the firmer foam also extends up the sidewalls especially around the mid-foot where it is also seen under foot through the outsole. The lime EVA is presumed to be an attempt to create more midfoot stability in this shoe. Overall, there is a lot of underfoot cushioning for what the shoe weighs. The midsole has a nice soft in the heel and responsive in the forefoot feel for me, but in a very nice graduated way that doesn’t get in the way of the transitioning of the shoe when I run. Peter: What was lackluster in the original Floatride turns exceptional here. This is the second shoe I’ve used that actually lives up to feeling “different” than other running shoes. The first, of course, is the Vaporfly 4%. 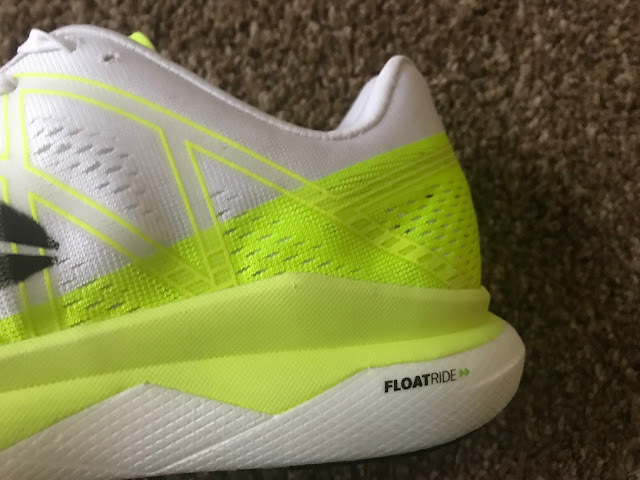 The Reebok Floatride Run Fast has a remarkable amount of cushion, bounce and responsiveness--especially for its low low weight, stack height and low-slung profile. The midsole is soft enough to be really forgiving yet it provides a ton of energy return to keep you sailing along at speed. Dave: The PEBA has not lost its touch after 75 miles of workouts so far. It is just as snappy as the first time I put them on. I have felt very smooth and powerful in this shoe on the roads and at the track. The shoe really keeps you on your toes. When you get sloppy in a workout, it reminds you where to land, mostly because of the PEBA responsiveness that makes you want to keep each and every stride powerful and poppy! The heel to toe transitions are quick and smooth and the shoe just gets better at faster paces. 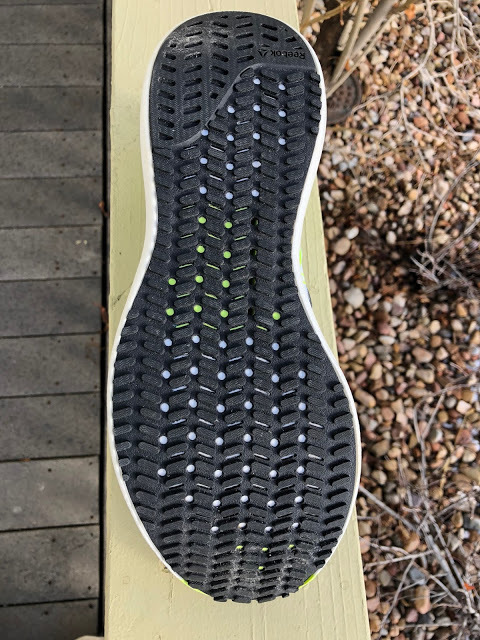 Sam: The combination of EVA for some stability, Float Foam and the outsole delivers an outstanding platform and one I found that ran well at all paces even very moderate ones. For such an amazingly light shoe there is plenty of forgiving, stable cushion and response here. But there is more EVA. Underfoot below the outsole we see an EVA layer/plate at the toe and under mid foot to stabilize the mid foot and provide some snap. On the next to last last row (but for one forward yellow showing partial depth hole) a series of round holes on the medial side four are drilled out through the EVA layer. Not sure what these holes may be intended for but they may be to ease transitions for more neutral type runners? Derek: The Fast uses a full contact outsole, with lots of high abrasion rubber, with lots of very thin strips of carbon-injected rubber to generate excellent grip. The full contact outsole also allows for a very smooth and predictable underfoot feel. I felt that the full coverage outsole was thin enough that it didn’t make the shoe feel too harsh, nor did it make the shoe overly stiff, which is often the case with a full coverage outsole. Peter: This outsole is a grippy MF. It just grabs the pavement and lets you push off of it. I can see why this shoe performed well at Boston, it is a sure-footed shoe. The full coverage outsole feels much better to me than the web outsole on the Adidas Sub-2. Dave: No issues with the outsole, 75 miles in and no wear and tear. I used the Fast for a hill session in the rain and it gripped nicely. My guess for a racer, this thing may pull close to 250 miles, which is real solid. It’s still feels good as new. I saw a bunch of the Fast in the Elite sections of Boston last Monday from the sidelines and as Peter said, it seems that it performed very well in the rain. Sam: Unike the Run with its 'waffles" the outsole here has a dense pattern of angled lozenges. The heel has a full contact large firmer rubber pad something I like. There has been zero wear to date in the 25 or so miles I have run them to date, not even the fine patterns are worn much, if at all. While I don't know whose rubber it is, its relative softness upfront and durability reminds me of... the Continental rubber used in sister company adidas performance shoes... The snappy flex point is a bit further back than in the Run, and Fast is not as stiff. On my initial runs with this shoe, I experienced a strange aching in the lateral midfoot. I had only experienced this with one other shoe before – the Nike Epic React. In the React, I attributed it to the snug fit of the knit upper. Here, I think it is because of the raised midsole along the midfoot and heel. I tend to land more lateral midfoot, especially at uptempo paces, and the raised midsole prevents the upper from stretching laterally at the midfoot, causing my feet to ache. The issue has gotten a bit better over time as the midsole stretched a little, and I managed to mitigate it further by using a thicker insole to get higher stack above the pinch point. Beyond this initial fit issue, I think this shoe has just enough softness in the heel to work as a long distance racer. I did not notice much compression in the foam in the forefoot but despite this, somehow there was very good vibration dampening. Even on easy runs where I’m shortening my stride and spending a lot more time on my toes, I don’t feel beat up in the shoe. I actually found the shoe to work very well on the track. In essence, the firm forefoot and the slight bounce of the track surface conspire to hit that balance of bounce and responsiveness right in the sweet spot. Outsole traction is another hidden gem with this shoe. Traction is excellent, better than many other lightweight racing flats for me (e.g. Nike Streak LT3) The shoe may not feel particularly special at easy paces, but once you get into the uptempo paces, it really shines because it has a very nice stable and smooth transition, but without the attendant harshness that often accompanies racing flats at this weight range. 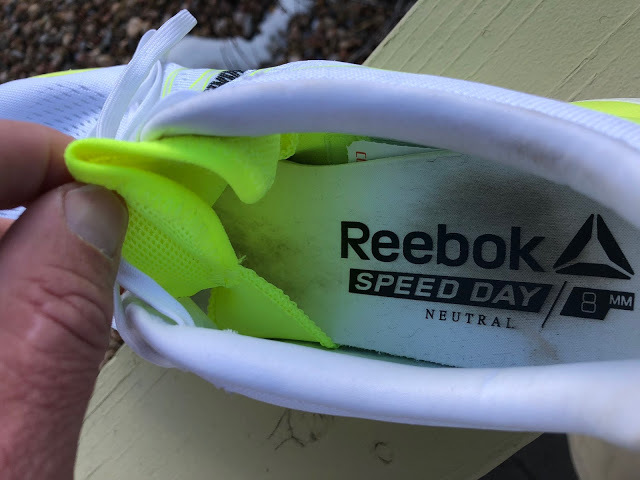 I did notice that my Run Fast in US9.5 came in at 6.9oz, inclusive of insole, so it is very likely that the spec listed weight for the Run Fast from Reebok is sans insole. As it is, given that it is essentially identical weight to the Nike Streak 6 and Vaporfly 4%, I would be hard pressed to choose it over the 4% for a full marathon, but for shorter races up to the Half, I think the Run Fast would make a fine choice for people wanting a shoe with good traction and cushioning. Had it come out two years earlier, a lot of Streak 6’s would be left on the shelf. The ride is really nice at any tempo, but just hums at speed. This is a really fun and super light shoe to run in. There’s plenty of cushion and protection for longer runs and plenty of speed for tempo days. I wouldn’t hesitate to run a marathon in them. In some ways they remind me of one of my all time favorite marathon shoes the Asics Hyperspeed 6. There’s a nearly perfect mix of cushion and responsiveness. As I mentioned above the traction is spectacular too. Dave: The ride of the Fast is very, very smooth. It was used for Tempo, Fartlek, Track and Hill sessions. Note: I have not raced in it yet as I am just beginning a new cycle (I’ve had the Fast for over 3 months in rotation). 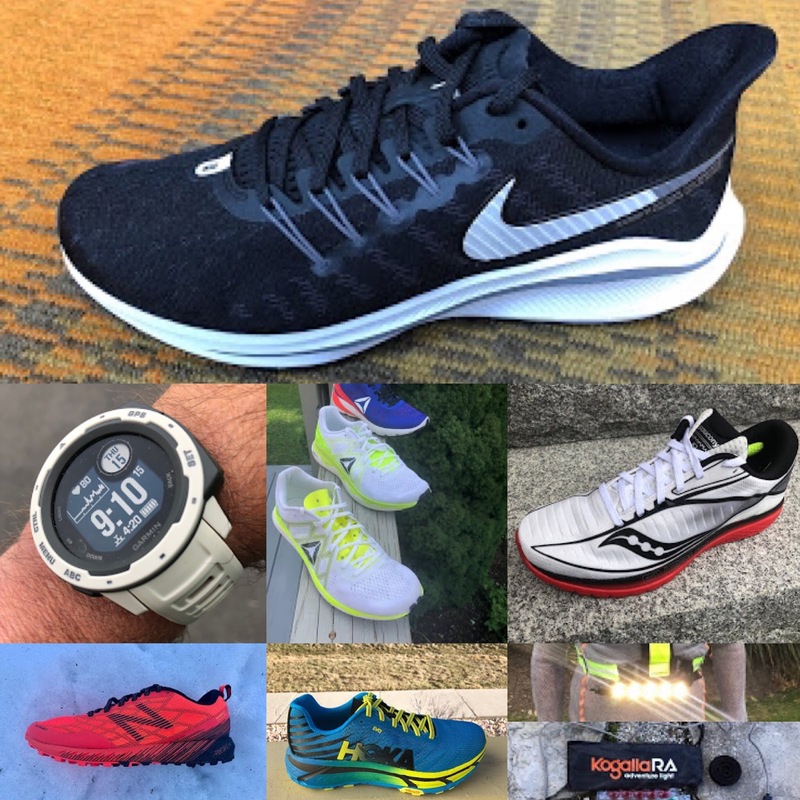 The Fast works well for hard days, but for days you want a really smooth shoe and you’re not feeling beat up (ie, recovery days) then it can definitely be a shoe for the mid week 8 to 12 miler. It’s just that smooth via the PEBA. It’s a shoe I continue to come back to for runs. That is always a key sign to me when testing. Incredible! To have a sub 7 oz shoe with this much responsive and stable real cushion is a wonder. This is one of those big smile shoes for me. I could easily train daily in them and have. All paces are welcome here and I have noted no compromise anywhere so far, although I have not as of yet raced in them. I do wonder how well the upper will hold me on curvy, fast hilly courses even at true to size. I walked away with happy legs from a relatively brisk 11 miler. Humm.. reminding me of the after run feeling in the Vapor Fly... The Float Foam Pebax is special stuff. Here it is applied in a more conventional design than in the super cushioned VaporFly with more road feel and more familiar transitions. It is a super light shoe which I want to reach for every day, and for any kind of run. -0.5 for the fit issue I had with it. The raised sidewalls are an unnecessary stability characteristic for a self-proclaimed neutral racing shoe, that ends up limiting the fit for people with wider arches and adds unnecessary weight. Lacing issues in the bottom of the “throat” and pinching now above the toes (-.5) and pointy toe box. -0.5 my only issue with the Floatride Run Fast is the tongue and its tendency to fold over. -0.25 for some tuning of the tongue and upper to give both a bit more structure. The Fast is more shoe for sure yet still commendably light at 6.6 oz, so 2.4 oz more than the Pro. It weighs $100 less on the wallet as well. The ride is more cushioned and more stable, the forefoot feel not quite as lively and despite the light weight, the difference in weight between the two is noticeable. The Fast clearly has a greater range of utility from daily training to racing and is very easy on the legs but it is not quite the ultimate short distance racing machine the Pro is. Derek: The Run Fast lacks the dynamic feel of the VF but does a very good job of offering an alternative, more traditional feeling shoe, while still providing very good vibration dampening properties. People who found the feel of the VF too radical or soft will like the Run Fast, as will people who want something with better traction for dirt trails or wet conditions. For shorter races, I think the Run Fast makes a compelling case, given it is significantly less expensive than the VF. Peter: I agree, this is a more conventional racing flat than the Vaporfly. One note on the Vaporfly; In my recent marathon I noticed that on roads with a bit of a tilt to one side it was accentuated by theVaporfly. I noticed i was fighting not to lean heavily to one side due, i think, to the stack height and relative softness of the shoe. The Floatride Run Fast would do better on cambered roads. Vaporfly also allows my legs to collapse in and I get some rubbing on insides of knees. Different shoes, but the Floatride Run Fast is a great choice. Sam: If the softer super cushion and radical geometry of the VaporFly is to much of a change and you are seeking versatility for all kinds of faster running, at a more reasonable price of $140 vs. $250, the Fast is about as good a race type shoe with both response and cushion as can be found. For otherworldly racing experiences the VaporFly is still the choice for me. Derek: I prefer the flexibility and the more dynamic feel of the Streak 6 forefoot. However, the heel is incredibly harsh for less efficient runners, and the Run Fast heel is one of the most cushioned on the market at this weight range. I think heel strikers and midfoot strikers will prefer the Run Fast while pure forefoot strikers will still prefer the Streak 6. Sam: Hands down the Fast for me. The Streak has a harsh heel on a narrow platform and beats me up. I would never dare run more than a 10K in the Streak or train in them at anything slower than race pace but would and have in the Fast, a far more comfortable versatile shoe. 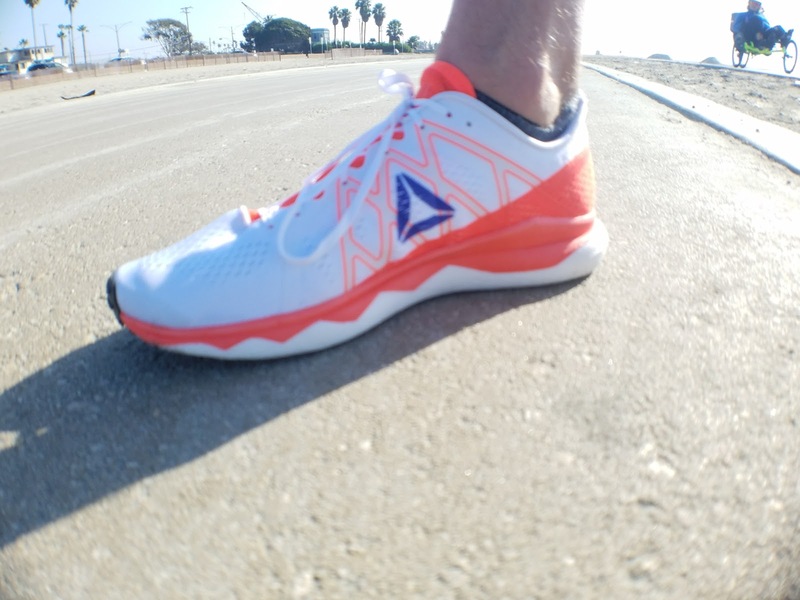 Derek: The ZE9 is a very different shoe from the Run Fast. Maybe even the opposite. The ZE9 has a very bouncy forefoot which again favours forefoot strikers more, while the Run Fast has a more traditional forefoot feel, with the main cushioning coming from the heel. Once again, heel strikers will prefer the Run Fast while forefoot strikers will still prefer the forefoot bounce of the ZE9. Despite the weight difference, these shoes don’t feel significantly different for uptempo work. I have used both for fast hard speed work on the track, and both work fine, with the Run Fast getting the nod for better traction. Peter: These actually seem pretty similar to me. I like both a lot. Will have to a/b them for a better comparison. Dave: Similar wheelhouse of shoes here with the ZE9. I was all about the ZE9 for a long time, but I gotta say, the Fast is just well, Fast. It’s smoother and it will last a lot longer. The ZE9 dies out for me after a while and needs to be replaced. Sam: The Elite has a great more secure upper but its softer heel leaves me lagging as a heel striker. Fast any day. Derek: Derek: I prefer the cushioning of the Fast for sure, though the Sub2 seems to fit me better. Both shoes have superb grip and shoe last a long time. I think for shorter races I’d go with the Sub2, and with the Fast if I had to do a half marathon or a hilly 10k. Peter: Floatride Run Fast is so much more enjoyable for me than the Sub 2. No comparison. Sam: I agree with Derek on the outstanding fit of the Sub2. Clear winner in that department. The Sub2 is firmer especially at the heel and for a 5 to 10K would reach for it before the Fast but for racing versatility the additional overall stack height, particularly at the heel with 4.5mm more and with only an insignificant weight penalty makes the Fast a better overall choice for me. Now put the extra stack of the Fast into the Sub 2 and I suspect the tables might turn for racing purposes as the Boost Light in the Sub2 is firmer and more responsive. 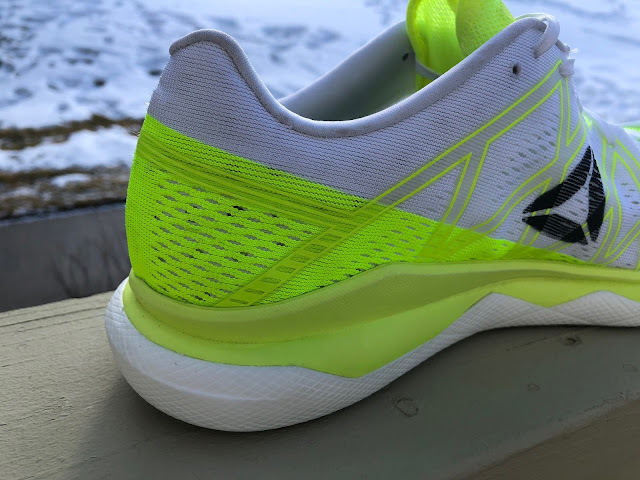 Derek: The LR4 has a similarly soft heel to the Run Fast, but the Run Fast feels much more cushioned with better vibration dampening all around. The Run Fast also had much better road traction. 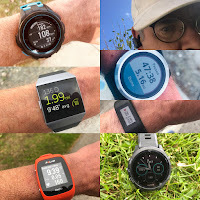 The main upside for the LR4 is that the LR4 has a softer forefoot; I have used the LR3 and 4 for several marathons with good results but I am not so sure the firmness of the Run Fast forefoot would be a good idea for the full marathon for me. Dave: These are very similar and both outstanding racing flats! My edge goes to the Fast here as I struggle more with overall fit in the Speed 5. The bunching around the toes in the Fast is the only issue I have with them, whereas the Speed 5 runs into problems for me with the hard plastic external heel counter. It flares up a calcaneus spur. FlightGen is a better midsole for me, but I’ll give the win to Fast do to how my foot actually functions in the shoe. Dave: Two of my current favorites right now. I just received the 1400v6 from New Balance and hit a tempo in it yesterday. Damn, it’s nice. The answer to this one for me is own both! I can see myself racing a Half in the 1400v6 or for long Fartlek Work I have next week (12 miles with 5 x 3 mins hard/2 mins easy + 8 x 1 min hard/1 min easy included in middle) where the Fast I’ll keep for shorter racing and track work. I used the Fast for a hill session (12 x 300m long gradual hill reps) a few weeks ago and it was so so nice. I’m going to have to monkey around more with these two. Maybe I’ll race a Half in the Fast to see how it handles. The Float Foam PEBAX seems to be built for the long haul. Dave: The K9 is back and better than ever. I love the FAST, but I get way more versatility out of the K9. It’s not that the FAST cannot be used for other runs, but I also am trying to keep it around for a while for races and workouts. The K9 just feels smoother with my gait. Sam: The Kinvara 9 leans more towards training, has a very competitive price, a superior upper and a touch more stability. A tough call. I get more smiles out from the Fast but more utility day in day out out of the Kinvara. Dave: They both are in the moderate to lightweight cush category with faster principles being applied. I like the Boston 7 a lot (B.A.A. edition) but it lacks some of the forefoot pop I want in a shoe. The FAST gives me that pop I am looking for. The Float Foam also gives a quicker heel to toe transition compared to the Boston 7. Boost just gets sloppy. And the Fast is way, way lighter. Sam Winebaum is the Editor and Founder of RoadTrailRun. He has been running and shoe geeking for 45 years. As he turned 60 in 2017 he was thrilled to clock a 1:35.24 half. Dave Ames is the Founder and Head Coach of Ame For It Run Coaching, a nationwide run coaching business, training athletes of all ability levels from 5K to Marathon. Derek Li is a family physician who lives in Singapore. He has been running marathons for the past four years with a 2017 marathon PR of 2:41 and a 2018 1:17 half marathon PR. Derek is focusing on a bid to run all the World Marathon Majors. In his free time, he likes to review running shoes and related products at his blog Running Commentary. The FAST were provided at no charge. The opinions herein are entirely the authors'. SHOP RUNNING WAREHOUSE FOR FLOATRIDE RUN FAST & FAST PRO! How does Reebok’s Pebax fare vs Skechers’s FlightGen Foam? I know it’s hard to compare across multiple models. I have the GoRun Ride 7’s and have been supremely pleased with them. A bit of a different comparison FlightGen to Float Foam as the Reebok Fast has EVA side walls and a plate in the mix whereas expect for the GOMeb Speed 5(review soon) the Skechers are all a single slab of FlightGen. I will say that overall I prefer the more energetic response but somewhat less bouncy as well feel of the Reebok FloatFoam set up, It is also silkier feeling underfoot while a bit firmer than VaporFly's Zoom X. I would say the closest comparison to the Fast is the Razor 2 and while I enjoy the Razor it is not as versatile as Fast and for me also not as...fast. Thanks Sam! Informative as always. Hi. Another great review, and another shoe i would like to try. I am also interested in the salomon RA road shoes. 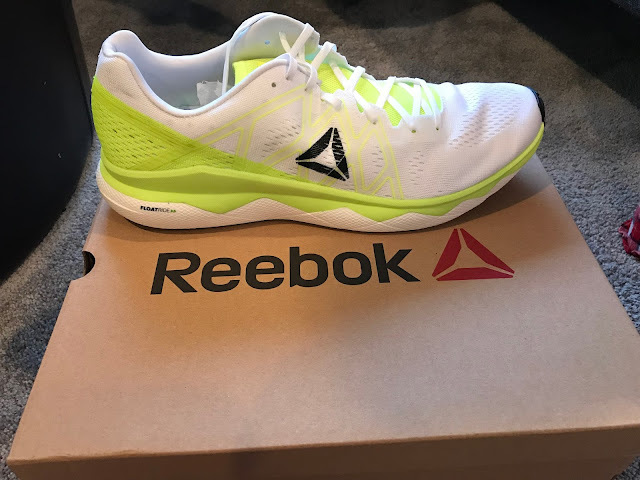 Can you tell me which of the models the reebok is most similar too and how you would compare them, please. Thanks! Seems like a really fast shoe but damn it's 300 $ here in Canada? The VF4 are 330 $ (when available). I'd give a shot to the VF4 first if one day I spend that kind of money on a pair of shoes. For now, Pegasus Turbo are in the mail! Can't wait! Just saw that it's the pro version at 300 $. That thing is crazy light! What size I should get in Floatride Run Fast, if I am 41 1/3 in Boston 6, 40.5 with Pegasus 35 and Pegasus Turbo and 41 in Epic React? You don't say how the shoes mentioned actually fit and how well. I would say normal 41 ? Hey guys, love your reviews. Is this shoe a candidate for a first marathon? I've been running for years and I'm a 35 mile a week guy now but have never tackled the big race. I currently run most of my miles in Adidas Bostons and Saucony Rides. I was going to use the Bostons for the marathon but on my longer (17 plus miles) training runs, bruised big toenail. So bigger shoes I guess and I'm looking for options. Thanks for reading such a lengthy epistle. PS I have some Tempo 9's on the way. Thoughts? Thanks for the kind words about RTR! Much appreciated! With years of running and decent mileage you should be ready to tackle the marathon. What is your goal time? How hilly is your marathon? Boston is pretty snug overall. I wonder if they are to big and you are slipping forward? You will find Fast similar up front but...with softer thinner mesh. Tempo is yet narrower and snugger than Boston for me especially at the metatarsals. It is very stable which can be very helpful in later miles when form starts to go but unless you run support type shoes maybe to much. The Fast has decent under foot stability from the EVA layer, more so for me at the heel than Boston which lacks any of the Torsion plastic of say the Adios Boost. If you have trained in it and it works well there is nothing wrong with your Ride. Others to consider the Reebok Sweet Road 2, stable heel flexible yet stable forefoot and a great easy on the foot and especially forefoot yet supportive upper and all of $100 and Kinvara 9. Finally Zoom Fly Flyknit might be in consideration if the toe box works for you Flyknit is snugger and stretches. Reviews of all of the above at the link below. What about a comparison between the Reebok Floatride Run Fast vs Nike Zoom fly flyknit? New Balance RC1400v6 Review: Stallion!